Pocket Truck Tycoon is an awesome truck business tycoon simulator from CookApps Play. Collect and deliver small goods. Start small and grow your business. 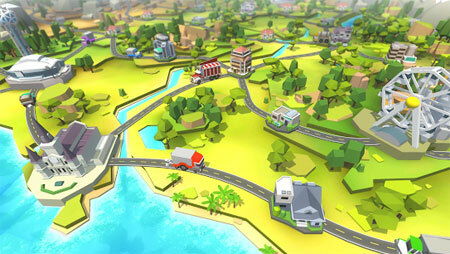 Make your tycoon dream come true by explorering the continent and growing your convoy. Mange your trucks and transport your cargo. Acquire new cities and expand to new areas to make more profit. Collect different types of trucks to improve your business. Upgrade ability of your truck to send to more cities. Design the most effective delivery routes to maximizes your profit. Transport cargo and complete missions to get various rewards. Expand to new area to grow your business. Acquire new cities, Design routes more effectively, Discover new landmarks. If you get stuck in the game, check out the video walkthrough and gameplay for the game. This entry was posted in Android Games, iOS Games, Mobile Games, Walkthrough and tagged Pocket Truck Tycoon Cheats, Pocket Truck Tycoon Gameplay, Pocket Truck Tycoon Guide, Pocket Truck Tycoon Strategy, Pocket Truck Tycoon Walkthrough by Marvin. Bookmark the permalink.